On the night of March 16, 2015, six members of a family, including three small children, were allegedly killed in a Syrian government poison gas attack in or near Sarmin (alt. Sermine, etc. ), in Idlib province. The alleged chlorine gas attack reportedly effected dozens of other civilians and some rebel fighters, and eyewitnesses say the gas came from improvised "barrel bombs" dropped by the Syrian military from a helicopter. That aerial aspect is widely taken as proving the government, and not anyone on the other side, deployed chlorine - and it's presumed that in turn is just what killed the family, named as Taleb. 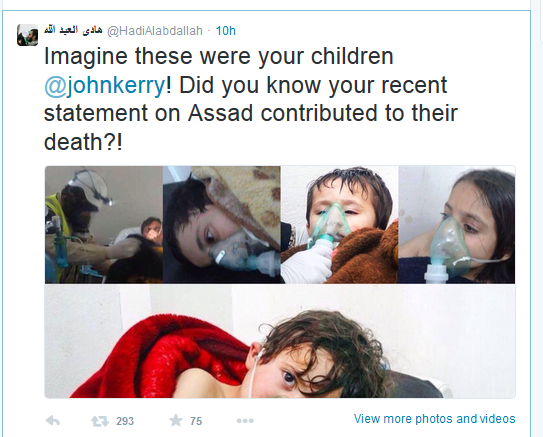 One prominent activist swiftly informed John Kerry via twitter that his statement about having to negotiate with Assad (meaning Syria's government) in the end contributed to the death of the five children shown(but all being non-Taleb children, these reportedly didn't die). The Kafranbel opposition, with its famous English banners held up by a crowd, made a similar case: "Kerry you encouraged Assad to transform both of your filthy breathing and ideas to chlorine and suffocated our children in Sarmine city." A number of other important questions and inconsistencies have been explored on the talk page (and elsewhere) but still not (two years later, March 2017) here on the front page. This will now be slowly updated to reflect the severity of our thrashing to the activist story here, and its importance to the public. Also, this event was the approximate first appearance of the now-infamous White Helmets, seen in videos from Sarmin on the night of the alleged attack, at the Sarmin field hospital where the Taleb babies died, and moving another baby to the same clinic the next day (see talk page). The two main videos of the Taleb children dying are filmed one by the new Idlib Civil Defense, and the other by the local Jabhat al-Nusra branch. Victims and patients at the hospital are seen with new custom-made blankets with the civil defense logo done in the gold-and-black colors of JaN in Sarmin. The victims are said to be Waref Mohammad Taleb, his mother Ayoush Hassan Qaq, his wife Ala al-Jati, and their three children: Sara Taleb, A’isha Taleb, and Mohamad Taleb. Nothing is independently known about them, or even if these are their true names. The baby Mohammed is of an unusual fair complexion; red hair and perhaps blue-gray eyes. As explored in the correlating symptoms section of the talk page, ACLOS assess the crucial clinical features of the Taleb children, finding they do not at all resemble chlorine gassing symptoms. Instead, they display almost the opposite of the expected signs, which are more consistent with those of an opiate or CNS depressant overdose. When they should be conscious, red in the eyes and face, and coughing loudly, they're instead unresponsive, limp, pale, not coughing at all, and barely even breathing. At least one child (Mohamed) is alive and breathing but comatose at the start of the footage, while the girls could be comatose or dead the whole time. Syrian government forces carried out a third chemical weapons attack last year, a confidential report to the UN Security Council has found. The leaked report says helicopters dropped barrel bombs holding chlorine gas, a prohibited weapon, on the north-west province of Idlib in March 2015. An earlier report by the Organization for the Prohibition of Chemical Weapons (OPCW) blamed the Syrian government for two other gas attacks in 2015. The government has not yet commented. The group's fourth report during a 13-month investigation sent to the U.N. Security Council late Friday shows there is “sufficient evidence” to confirm the government’s role in the March 16, 2015 strike on Qmenas in Idlib governorate. Syrian American Medical Society: Press Release: SAMS Hospital Treats over 70 Severely Injured from Chemical Attack in Sarmin, Idlib and Condemns Attack. For Immediate Release. March 17, 2015, Washington, DC. 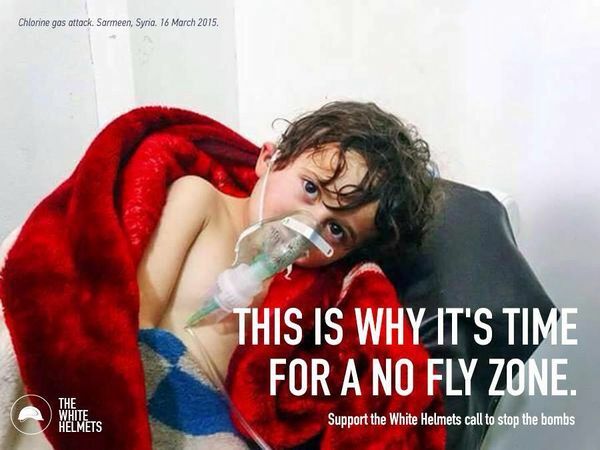 About Those Chlorine Gas Attacks in Syria: Humanitarians for War, part 2. By Rick Sterling, founding member of Syria Solidarity Movement (and ACLOS site member). Counterpunch, April 3, 2015. This page was last edited on 25 March 2017, at 10:53.